Red Bull Racing has snatched defeat from the jaws of victory in Monaco overnight, handing a near certain Daniel Ricciardo win to Mercedes’s Lewis Hamilton. The wet-dry Monaco Grand Prix race-winning strategy hinged on the switch from wet-weather to slick tyres at around lap 30, but the inconsistently drying Monte Carlo streets made the decision difficult. After eight laps the circuit was dry enough to allow racing to begin, but on the first full-speed lap Jolyon Palmer’s Renault snapped on the front straight over the painted lines of a pedestrian crossing, causing a two-lap virtual safety car. Under the reduced speed cars switched from full wets to intermediates, with Button stereotypically being amongst the first. Back at full speed on lap 12, Räikkönen hit the walls at the hairpin, losing his front wing. Felipe Massa’s Williams rear-ended the Ferrari, and as Räikkönen attempted to crawl back to the pits he collected Romain Grosjean’s Haas. As the midfield scrapped away for points in the damp, Daniel Ricciardo was having no trouble escaping from the battling Rosberg and Hamilton, with the former struggling with overheating brakes but the latter unable to find a way past. By lap 17 the gap was up to 17 seconds — but Mercedes, watching its race slip through the cracks, switched the struggling Rosberg with his teammate, unleashing the faster Hamilton on the leading car. Rosberg proceeded to sink through the field. More cars switched to intermediates despite there being no obvious pace advantage over the deep treads of the full wet — the track was so greasy that the grip simply wasn’t available on either tyre. On lap 23, with the track fast approaching a clear dry line and with all cars bar Pascal Wehrlein’s Manor and Hamilton’s Mercedes already on the intermediate tyres, Red Bull Racing pit Ricciardo for his own set of the green-marked tyres. With the track rubbering in Ricciardo’s times on the intermediate tyres improved, and the Australian reduced the nine-second gap to nothing within five laps. Hamilton and Ricciardo sparred for a short period of time, but the track was drying quickly now and teams were preparing to move to slick tyres. Hamilton, in a masterclass of tyre management, was prolonging the life of his wet tyres despite a notable lack of standing water on the circuit. Mercedes looked to put Hamilton on a single-stop strategy by having the Briton stretch his wet stint long enough to switch straight to a set of slicks, and with Ricciardo already on intermediate tyres, the question was who would blink first. In the end it was Mercedes, which stopped Hamilton after 31 laps for a set of ultrasoft tyres. Red Bull decided to bring Ricciardo in a lap later, banking on his warmed-up intermediate tyres neutralising Hamilton’s advantage on new slicks. The plan seemed to be set to work when Ricciardo entered the pits on the next lap, but his team made a critical communication error that left his car in the box for more than 10 seconds without tyres. His mechanics scrambled for his single set of supersoft tyres, but by the time is car left the pit lane Hamilton was already blasting around the first turn. Try as he might, Ricciardo was unable to make an impression on the leading Mercedes car, and by the end of the race lost touch with the Briton amongst lapped traffic. 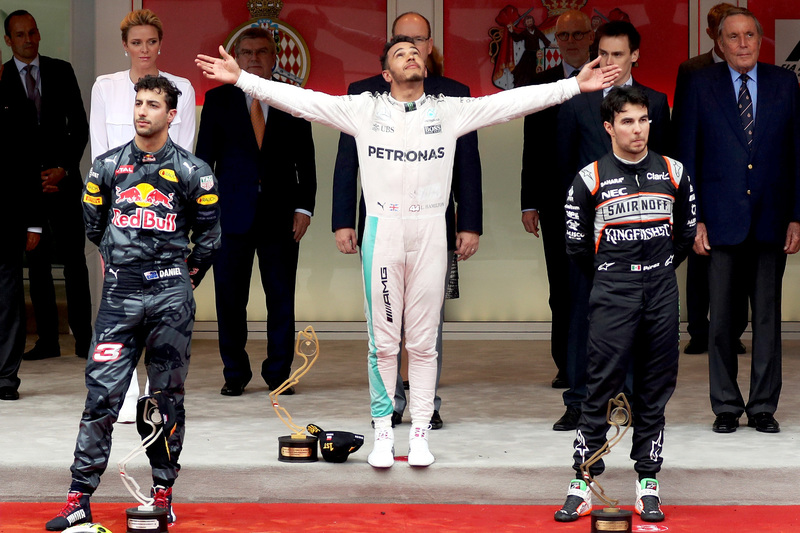 “I don’t even want to comment on the race to be honest,” said a despondent Ricciardo at the podium presentation. “I’ll just say thanks to the fans. I guess from the outside we put on a show — but it shouldn’t have been as exciting as it was, to be honest. “I was called to the box — I didn’t make the call, I was called — and they should’ve been ready. It hurts. I don’t have anything else to say to be honest. “We put ourselves in a race with Lewis we didn’t need to be in. Second place doesn’t show much for it. Lewis Hamilton, however, bounced back from his own moment of despair after a qualifying performance that put him third on the grid to take his second career F1 Monaco victory. “Thank God that today went the way that I’d hoped,” he said. “A big thank you to my team for providing me with a great car to see it through to the end. The Briton said the key to his race victory was managing his tyres, which exceeded the expectations of even Pirelli’s own engineers. “I’m telling you that was the longest run, in particularly after I’d stopped for those tyres. Hamilton paid tribute to the dejected Ricciardo — a position he could empathise with after himself losing what should have been an assured victory this time last year. “A big congratulations to this guy [Daniel],” he said. “He drove phenomenally all weekend, just one of the best drivers I’ve raced against. Nico Rosberg was unable to demonstrate pace at all similar to his front-running rivals, and nor could Ferrari, on yet another underwhelming weekend, capitalise on his absence, leaving a sensational Sergio Perez to take third place. The Mexican ran a similar race to Daniel Ricciardo, and his first stint on the wet tyre was longer than Sebastian Vettel’s in fourth, who ran a longer middle stint on the intermediate, but it was Perez’s final stint on the soft that allowed him to deliver on the car’s potential. “I’m really happy because my team has done a tremendous job with the strategy, the calls, and with the pit stop,” he said. “I think we did the right calls. The best tyre for us were the softs at the end. Sergio Perez is expected to renew his contract with the team in the near immediate future. Vettel finished behind Perez and ahead of Fernando Alonso in the Spaniard’s equal best finish since re-signing for McLaren-Honda. Nico Hülkenberg and Nico Rosberg sparred for much of the race, the latter’s car capable of only the Force India’s pace, and it was Hülkenberg who took home the two extra points with a move at the last corner of the last lap. Carlos Sainz led home Jenson Button, while Felipe Massa scored on precious point for Williams on another dreadful Monaco weekend. Max Verstappen and Daniil Kvyat were notable retirements, Verstappen after a crash heading towards casino square after understeering into the barriers and Kvyat after botching a move on Kevin Magnussen.